This set and all other products at Gina K. Designs are 25% off through December 31, 2015 only! You must use the code SAVE25 and hit apply when checking out for this discount. Happy shopping! Hello all! Just a few Twine Time cards from the party that I haven't yet shared on my blog, plus two new ones! Love these twine flowers and tucking the scissors into the spool for a different look! Super CAS. Good for a guy. Maybe minus the bow for your guy ;) Next video I think is tips for "setting" my faux eyelets! Lots of possibilities and layouts with these, I'm excited! In the busyness of the season, I hope you've had time, or will soon find time, to reflect on 2015. I pray you are able to enjoy a wonderful weekend with family and or friends, or if you are far from both, that there is a neighbor nearby you can seek out to fellowship with! My family and I are so grateful for the blessings of this past year, but most importantly the gift of Jesus. Looking joyfully forward to 2016! Grateful for all of your business, love friendship and support! ]Hugs to you and yours! Good morning! The Cast and Crew for Gina K Designs welcomes you to another fabulous Inspiration Blog Hop, this time, for our December Release! We hope to inspire you with some beautiful card projections as you hop along. Please enjoy the gorgeous inspiration samples from the team and then comment on each blog for your chance to win an awesome grab bag of GKD goodies! To see who won, check the Big News Forum at StampTV on Thursday after the hop. I hope you are loving my new Twine Time set as much I am! 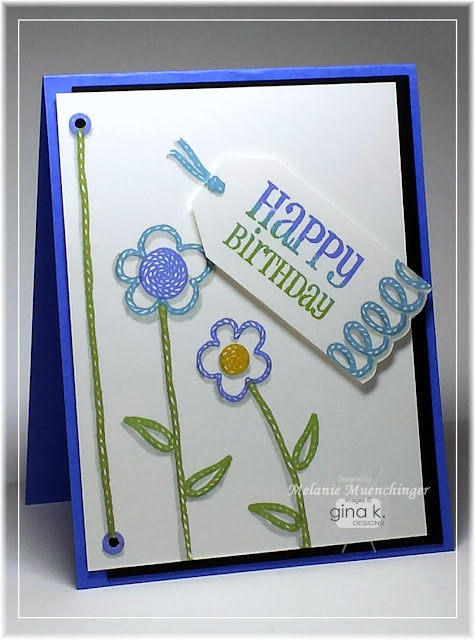 You can put together a ton of different greetings with the twine script words in this set, and make that the focal point of your card. 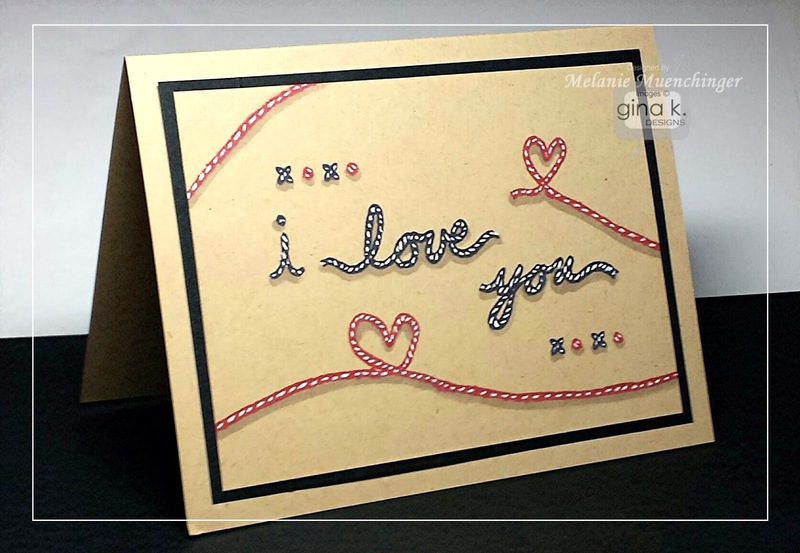 Here I stamped the twine in GKD Black Onyx and Cherry Red, and then used a white gel pen to dot or dash inside the twine to really make it pop off the Kraft. I love this look! If it looks or sounds like that would be time-consuming, it's really not, the same amount of time or less than having to color an image, and its like doing "dot to dot", no shading or blending, you know? 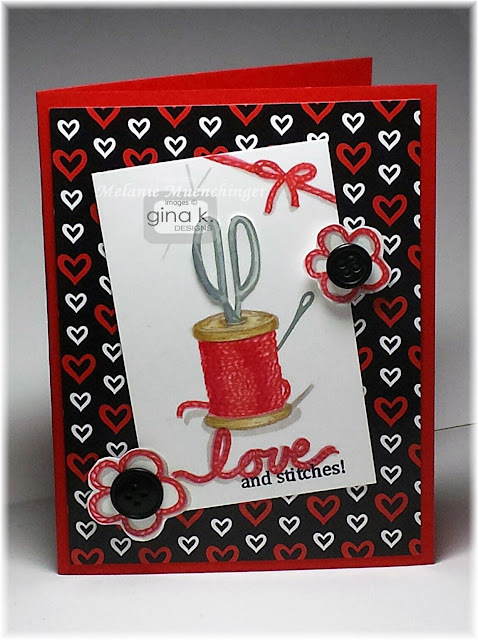 I thought it would be fun to use the knot and crossed stitch to serve as XOXO hugs and kisses, just came to me while I was deciding how to finish the card! Use a BG3 Spectrum Noir or other gray marker to trace the underside of all stamped images. Cardstock is GKD Black Onyx and Kraft. Finally, I know you're all done making your Christmas cards (Right? Right?? No, neither am I!) but here is a fun design with the clothespin, using the top of the spool as a halo, isn't that sweet? (The twine double bow fits just right around the pin, love it!) You can adapt this angel design to cards after the winter holidays using the "...angel's hands" sentiment in the set. :) Cardstock is GKD Pure Luxury Cherry Red, White and Fresh Asparagus. 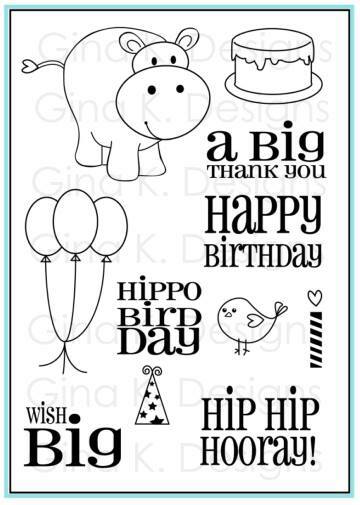 This one you can also change to a birthday or thank you simply by swapping out the greeting and the patterned paper. 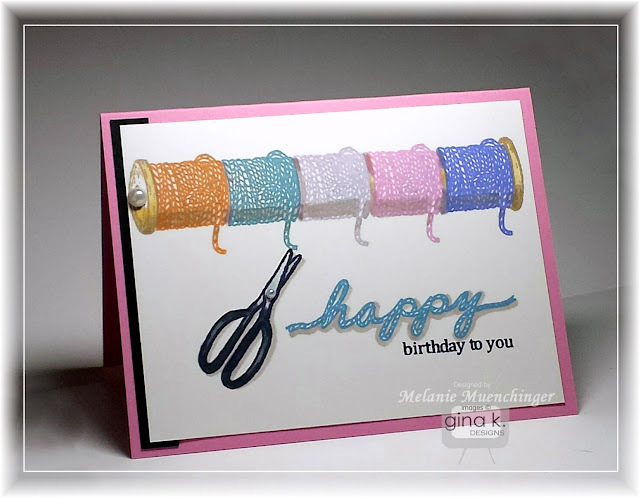 I love how many wraps and borders you can make for your cards with the single twine piece and the little pieces! Next, some super cute little (er, one not so little!) 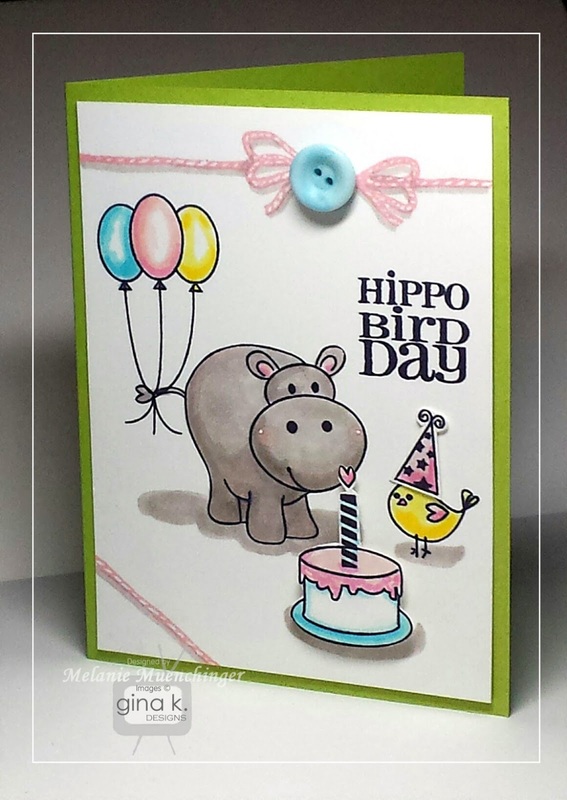 critters in this Hippo Bird Day set by Beth Silaika! Images are stamped in GKD Black Onyx and colored with Spectrum Noir markers, BG3, BG4, CR3, IB2, GB. 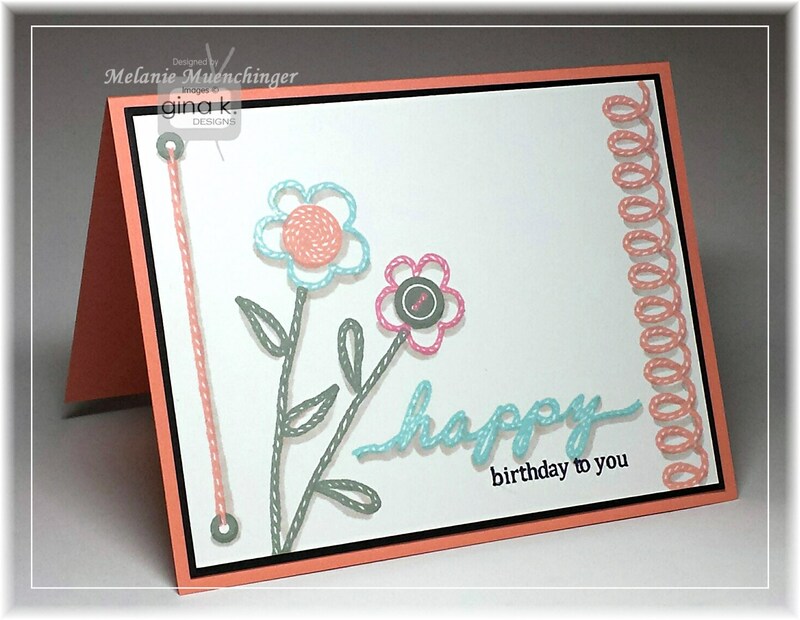 To embellish the card, I stamped the twine and bow from my Twine Time set in GKD Innocent Pink, drew on a shadow with BG3, and then added a real button. Cardbase is GKD Pure Luxury Jellybean Green. 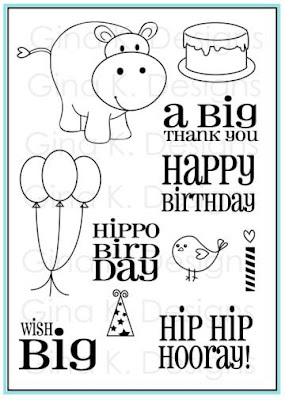 And since I managed to get every image from Hippo Bird Day in the card above, I wanted to use a greeting from the set that contains neither birds nor hippos, just a simple "Happy Birthday"! This one I showed at the release party, but wanted to share some details. I inked it carefully with three pads (GKD Wild Wisteria, Grass Green and Powder Blue) and then stamped up a little scene with my Twine Time set. (It goes with everything!) I love that you can use that one loop in the set to make a row of loop-de-loops the way I did on this tag, so fun as a trim! And see the little tie for it? That's stamp two! Stamp it on the edge of your tag, ink it up again and stamp it underneath to make the tied part hanging off and pop the tag up. Easy peasy! No eyelets used here, either! 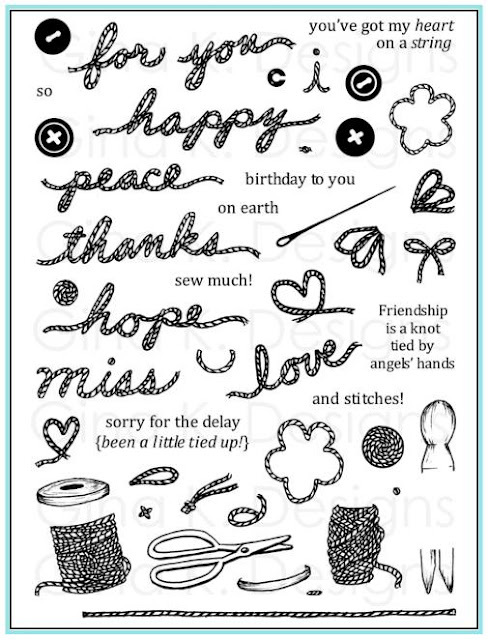 I love being able to add these stamps and then mask the single piece of twine in any length I choose to connect them! TIP: Punch through the center of the stamped eyelet image for added realism to reveal the layer underneath. Ready for more awesome creations?! Just click on the links below for more from the Illustrators and Design Team!! 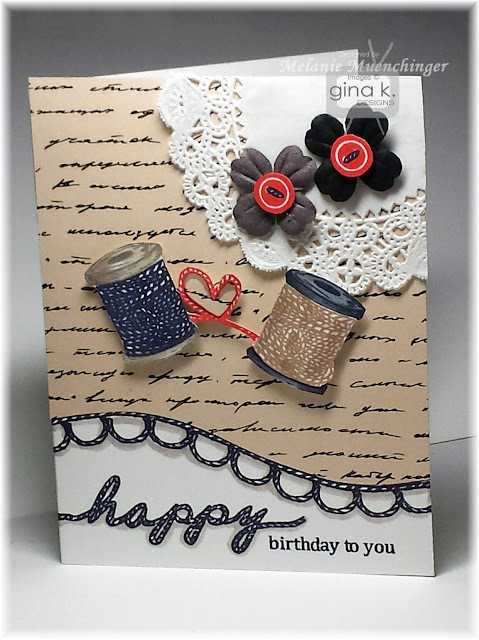 Twine Time is now available for purchase at Gina K. Designs! Thank you everyone for checking out our StampTV release party last night! I haven't completed my tip sheet yet because with 46 images in the set, there is just a lot to say! (Some I haven't even come up yet lol!) 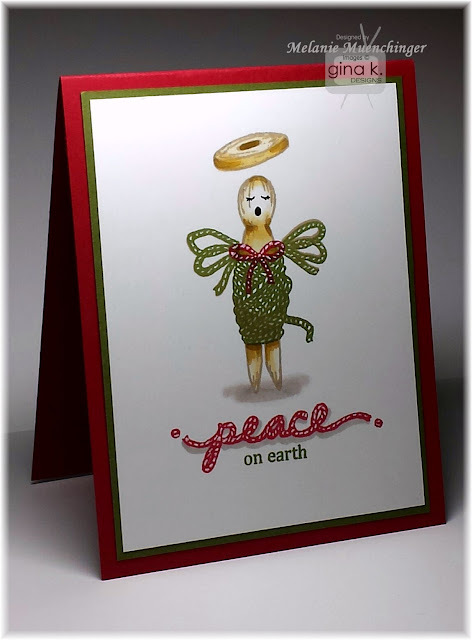 ;)We saw some wonderful ideas executed by my fellow design team members that will knock your socks off like the scissors cutting through a layer of paper by Beth , or using the clothespin and bow to make a little angel by Cat, and much much more! See what i mean? Here is the party thread to check out the chatter and all the beautiful samples shared if you were not able to make the party. And these were just a peek! We have an inspiration blog hop with the whole team and the new sets next Monday. So mark your calendar! Have a great weekend and I will see you on Monday! (New video with my set on my Youtube channel if you can't wait! ;) I made it before Gina shared hers, lol, but there are several differences! I like how give different tips, always different ways to do things. You're Invited: Gina K. Designs Release Tonight! I'll be there, will you? 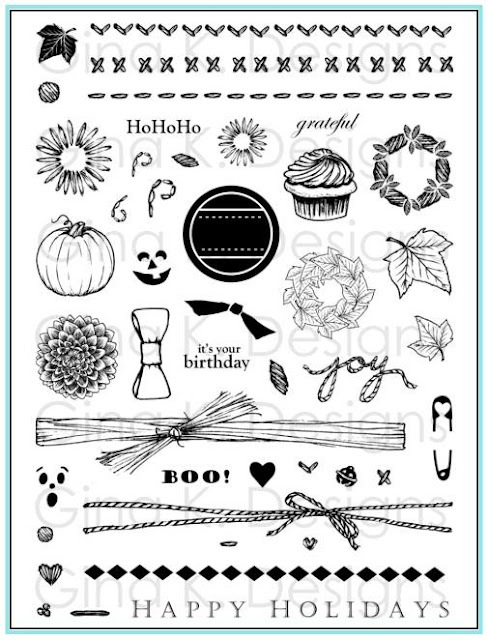 :) Challenges, chat, prizes and lots of samples from the design team with the new stamps! So stinking excited for the release of my Twine Time set! Thank you all for the wonderful feedback! Good morning! 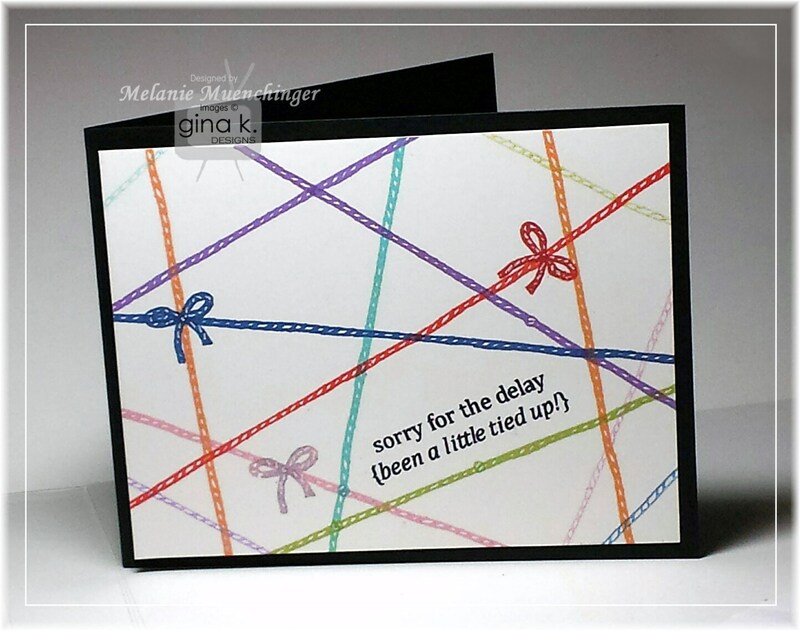 Today’s knot tying card is so fun and easy to make, and your recipients will be completely charmed when they open it! 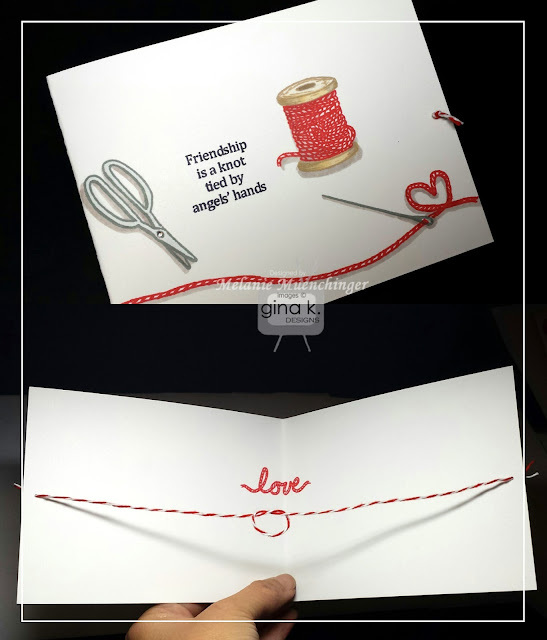 Perfect to go with this sweet sentiment of friendship in the Twine Time set, or for a Valentine or to announce or congratulate an engagement or wedding, this interactive technique is a great use of your twine and these coordinating stamps. 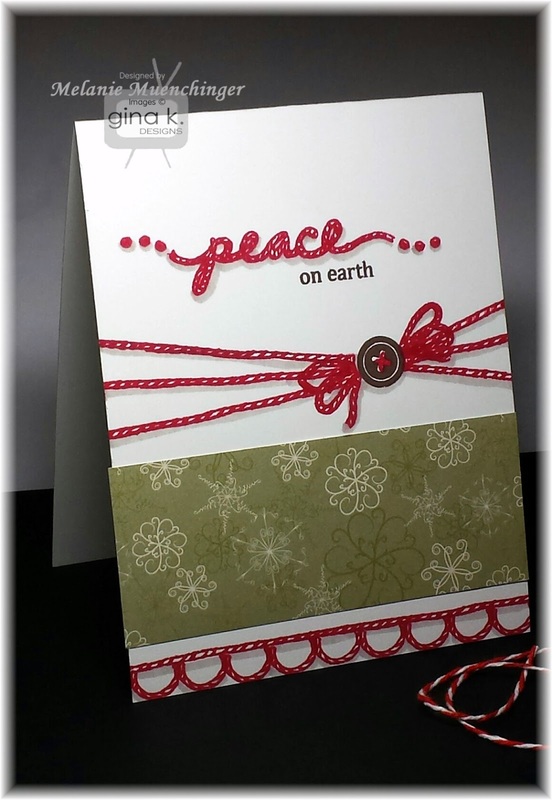 Releasing on Thursday, December 17th at Gina K. Designs, that's in two days, eek! You are so gonna LOVE this set! It's one of my favorites, ever! Thanks for stopping by and your comment today, and please plan to attend our release party Thursday at StampTV! Hello, new video this week! I hope you all enjoyed the simple diaper card last week! Click here if you missed)! 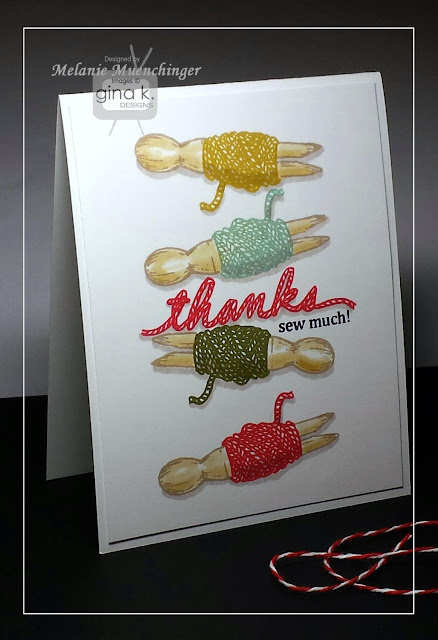 Today's card using the pin again (from Triple Play Holiday) shows you you do't have to wait for a friend who's expecting to make use of these fun images! looks pretty darn real, right?? This card just reminds me of all my sweet besties! The long greeting is from Triple Play Fillers.